There are currently 9.2 billion tons of plastic on the Earth and it takes at least 450 years to decompose, or in some cases, it’ll never fully decompose. While I’ve been focusing on shopping mindfully and consciously, reducing my plastic footprint is something that I’ve never tackled until recently. Reducing your own plastic waste can be initially a daunting thought, and it was for me too! Here are a couple of my personal tried and true ways to easily start reducing your waste. After realizing that disposable coffee cups were actually not as easily recyclable as I thought, I started seeking out alternatives. Disposable paper cups are actually lined with plastic polyethylene, which is the reason why the cup can hold liquid. I decided to purchase a Keep Cup, and made a commitment to myself to not purchase coffee unless I have my Keep Cup on me. You can usually find Keep Cups in local coffee shops This has proven to be very effective especially on my coffee walks at work! To top it off, my Keep Cup is so beautifully designed! I’ve been following Package Free Shop on Instagram for a while now, and they’re an incredible resource for easily finding eco alternatives to single-use plastic products. 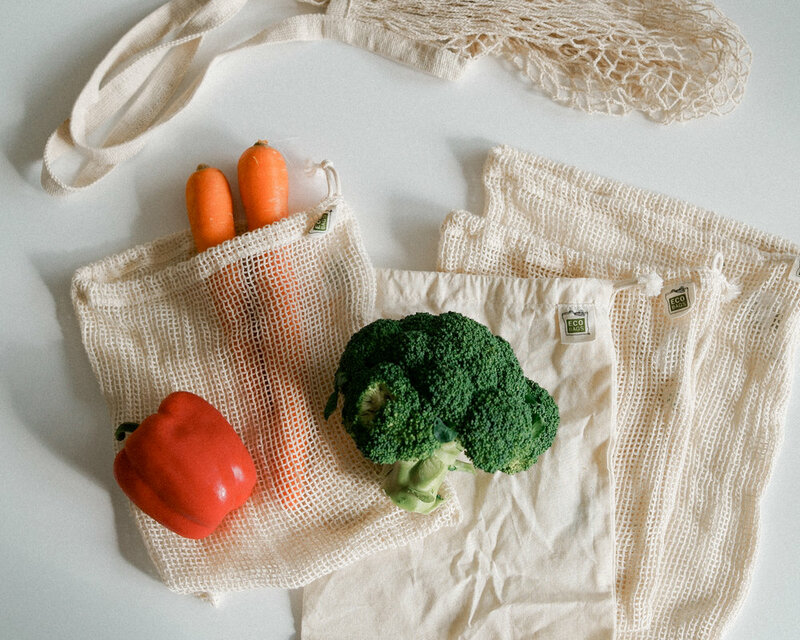 As I was grocery shopping one weekend, I noticed I had been using plastic produce bags for as long as I could remember. It was that weekend I stopped and thought, did I really need a plastic produce bag for my bananas? Needless to say, I’m embarrassed that I did that! I’ve been using these great lightweight cotton bags from Package Free Shop in medium and large. Now, its second nature for me to grab these bags along with my reusable grocery bags for my weekly grocery trips. For a long time, I was stuck using our plastic zip lock bags which we bought before my decision to reduce waste. I wasn’t in a hurry to find a solution because I was using something I already bought and I wasn’t going to throw it out just because of my goal. Now that would be wasteful. It was a bit out of the blue when I discovered a Quebec small business called Demain Demain on Etsy one day. I love bringing fruits as snacks when I go out, so when I came across Demain Demain and saw their products, I thought it was perfect! Sometimes I felt that my snack containers were a bit bulky and takes up too much space, especially after I finished eating them. 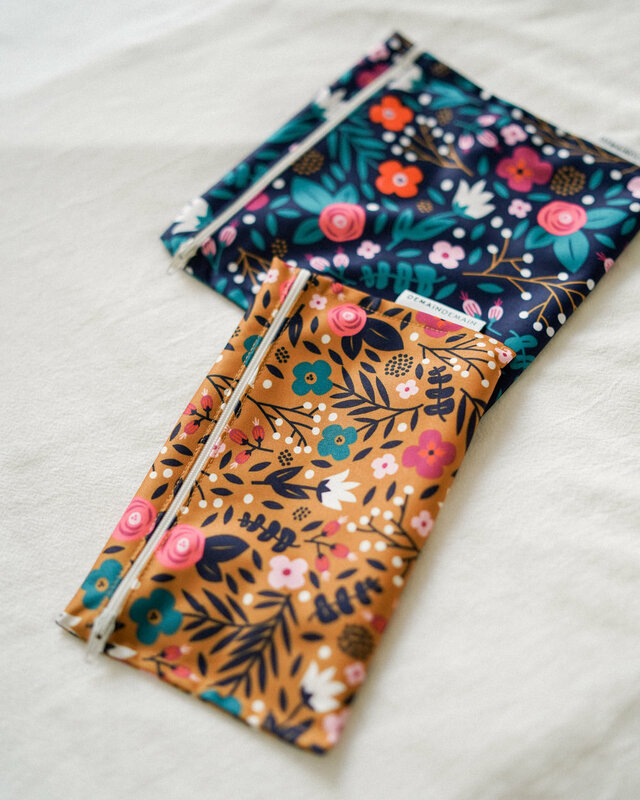 I’ve been using these Demain Demain pouches for a while now and I love them – especially how pretty they look! They’re easy to wash, made from recycled plastic water bottles and has an inner coating that makes it perfect for carrying “moist” snacks (for example, apples).